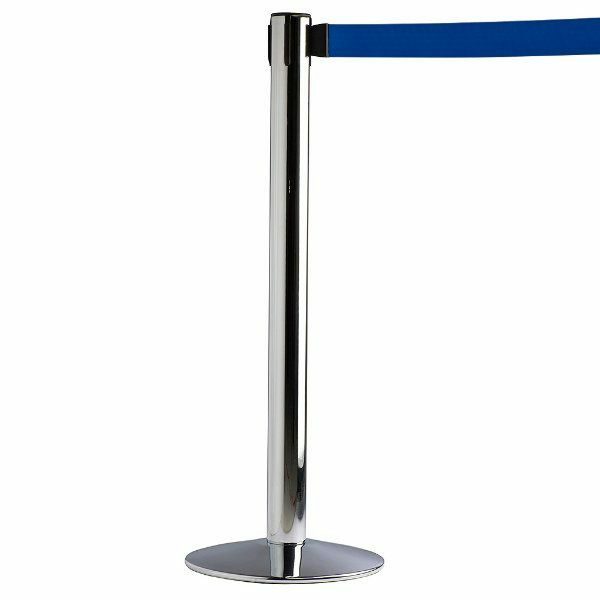 CHROME FINISH STANCHION WITH BLUE RETRACTABLE BELT If you are looking for a sleek, stylish but budget friendly stanchion systems,crowd control system or as also called retractable barrier posts, then you are on the spot. With its chrome finish base and post this retractable stanchion post brings the high quality along with long lasting use. As many posts as required can be connected just attaching the belts from one post to another. 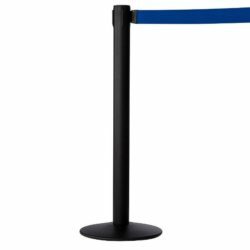 Each retractable stanchion post has 4 way adaptor for multiple side configuration. Each chrome finish stanchion is 37″ long. And each nylon blue belt which has a printable area of 1- 4/7″ x 103- 2/7″ can extend up to 114- 1/6″. Heavy base brings the stability to the retractable barrier post. The bottom of the base of each stanchion post is rubberized to enhance the hold of the stanchion on the floor as well as to protect the floor from getting scratched or damaged. Assemble and disassemble is so easy. Just screw the post to the base with a little help of a spanner. These crowd control systems can fit any environment perfectly and manage crowd most effectively.